﻿ Ephesians 2:3 Among them all of us also formerly passed our lives, governed by the inclinations of our lower natures, indulging the cravings of those natures and of our own thoughts, and were in our original state deserving of anger like all others. Indeed, all of us once behaved like them in the lusts of our flesh, fulfilling the desires of our flesh and senses. By nature we were destined for wrath, just like everyone else. 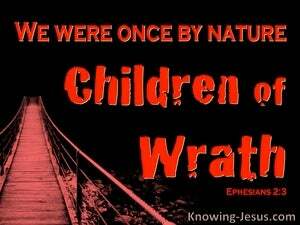 Among whom we also all once behaved in the lusts of our flesh, doing the intentions of the flesh and of the thoughts, and were by nature children of wrath as also the others. All of us [Jews] also once lived among such people, fulfilling the improper cravings of our physical being and doing what our bodies and minds desired. In this natural [unconverted] state we were deserving of [God's] wrath, just like the rest [of mankind]. 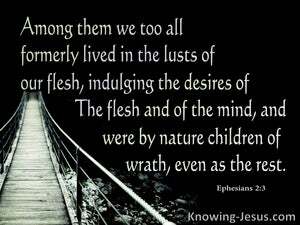 Among them we all once lived in the lusts of our flesh, following the desires of flesh and mind, and so we were by nature children of wrath, like the rest of mankind. We all lived among them once, indulging our physical cravings and obeying the impulses of our lower nature and its thoughts, and by nature we were doomed to God's wrath like other men. in the desires of the flesh, doing the will of the flesh and the mind, and were by nature children of wrath, even as the others. among whom also we all had our conversation in times past in the lusts of our flesh, fulfilling the desires of the flesh and of the mind and were by nature the children of wrath, even as all the others. Among whom also we then all occupied ourselves in the eager desire? of our flesh, doing the wills of the flesh and the thoughts; and were by nature children of wrath, as also the rest. among whom also we all formerly lived in the desires of our flesh, doing the will of the flesh and of the mind, and we were children of wrath by nature, as also the rest of [them] were. among whom we also had our way of life in times past, in the lusts of our flesh, fulfilling the desires of the flesh and of the thoughts, and were by nature the children of wrath, even as others. among which we also had our conversation in time past, in the lusts of our flesh, and fulfilled the will of the flesh, and of the mind: and were naturally the children of wrath, even as well as others. among whom all of us lived, we as well as you, when we obeyed the passions of our flesh, carrying out the dictates of the flesh and its impulses, when we were objects of God's anger by nature, like the rest of men. And among them we all once passed our lives, indulging the passions of our flesh, carrying out the dictates of our senses and temperament, and were by nature the children of wrath like all the rest. among whom also we all have had our conversation in time past, in the lusts of the flesh, fulfilling the desires of the flesh and of the mind, and were by nature children of wrath, as well as the rest. And it was among them that we all once lived our lives, indulging the cravings of our earthly nature, and carrying out the desires prompted by that earthly nature and by our own thoughts. Our very nature exposed us to the Divine Wrath, like the rest of mankind. once lived while gratifying the cravings of our lower nature, as we continued to carry out the impulses of our lower nature and its thoughts, and by nature we were exposed to God's wrath, as the rest of mankind. among whom also we were all conversant heretofore in our carnal desires, indulging the appetites of the flesh and of our imaginations; and were by nature children of wrath, even as others. which were once habitual to you while you walked in the ways of this world and obeyed the Prince of the powers of the air, the spirits that are now at work in the hearts of the sons of disobedience--to you God has given Life. but worldly cares and the deceitfulness of wealth and the excessive pursuit of other objects come in and stifle the Message, and it becomes unfruitful. who were begotten as such not by human descent, nor through an impulse of their own nature, nor through the will of a human father, but from God. The father whose sons you are is the Devil; and you desire to do what gives him pleasure. *He* was a murderer from the beginning, and does not stand firm in the truth--for there is no truth in him. Whenever he utters his lie, he utters it out of his own store; for he is a liar, and the father of lies. For this reason, in accordance with their own depraved cravings, God gave them up to uncleanness, allowing them to dishonour their bodies among themselves with impurity. What then? Are we Jews more highly estimated than they? Not in the least; for we have already charged all Jews and Gentiles alike with being in thraldom to sin. Abandonment to earthly things is a state of enmity to God. Such a mind does not submit to God's Law, and indeed cannot do so. Having therefore these promises, beloved friends, let us purify ourselves from all defilement of body and of spirit, and secure perfect holiness through the fear of God. For there was a time when we also were deficient in understanding, obstinate, deluded, the slaves of various cravings and pleasures, spending our lives in malice and envy, hateful ourselves and hating one another. What causes wars and contentions among you? Is it not the cravings which are ever at war within you for various pleasures? Once you were not a people, but now you are the people of God. Once you had not found mercy, but now you have. If we claim to be already free from sin, we lead ourselves astray and the truth has no place in our hearts. These men are murmurers, ever bemoaning their lot. Their lives are guided by their evil passions, and their mouths are full of big, boastful words, while they treat individual men with admiring reverence for the sake of the advantage they can gain.